I never understood why this color is described as "Ice Blue" because they look aqua. 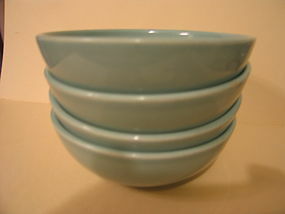 This is a set of 4 cereal bowls (5 1/4 x 1 7/8 inches). Some show usage marks to the floor of the bowl, one has a paint flake to the rim and one has what appears to be a skip in the paint finish to the rim. Additional photos by email. I need your zip code to calculate the postage.